Brad Davis has jammed with the likes of Willie Nelson, Earl Scruggs, Emmy Lou Harris, Marty Stuart, Dwight Yokam, Tommy Shaw, Travis Tritt, Merle Haggard, Johnny Cash and now he wants to jam with you! 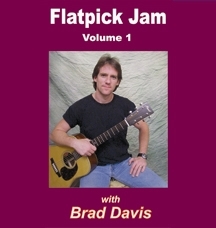 With Brad's Flatpick Jam Series you are never without a jamming partner. Each two-hour CDC and DVD is packed with flatpicking jam session favorites. Brad plays each tune at four different tempos (slow, slow/medium, medium/fast, and fast) so that you can work on your tone, timing, note clarity, and fluidity at the slower tempos and then work to develop your speed at the higher tempos.At each tempo Brad takes a solo then plays rhythm so you can take your solo. 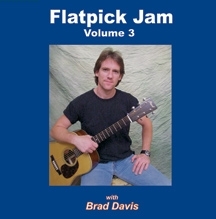 At the three higher tempos Brad swaps solos and rhythm with you twice. This gives you the opportunity to practice your solo and rhythm seven times on every tune. 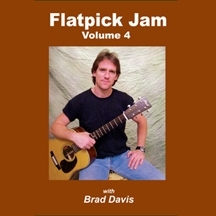 On each tune Brad plays a variety of rhythmic and lead styles. A bass line and mandolin chop accompany every song at every tempo, and chord changes are indicated on-screen (for the slow tempo). We also provide you with transcripts to all of the songs - click here to access. Review song list and click on CD or DVD below to purchase. Not familiar with all of the songs? 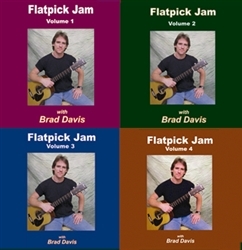 Click here to find transcriptions for each tune that Brad Davis plays in the Flatpick Jam series.